The bite of an infected mosquito introduces asexual forms of the parasite, called sporozoites, into the bloodstream. Sporozoites enter the hepatocytes and form schizonts, which are also asexual forms. Schizonts undergo a process of maturation and multiplication known as preerythrocytic or hepatic schizogony. In P vivax and P ovale infection, some sporozoites convert to dormant forms, called hypnozoites, which can cause disease after months or years. 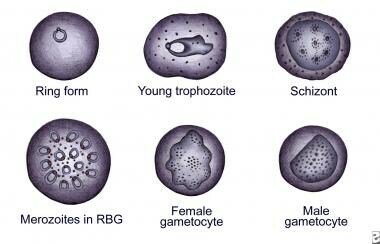 The images below detail the various stages of the Plasmodium life cycle. 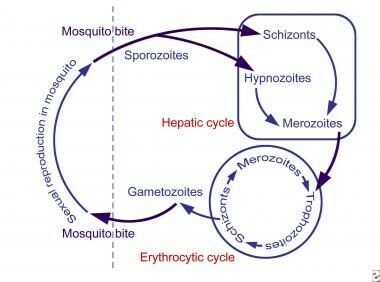 The various stages of Plasmodium life cycle are shown. Knowledge of the life cycle of the malarial parasite is essential to understanding the chemotherapy of malaria. The various stages of Plasmodium vivax as observed on Giemsa staining of a peripheral blood smear. The various stages of Plasmodium falciparum as observed on Giemsa staining of a peripheral blood smear are shown. The presence of more than one parasite in an erythrocyte is unique to this species. Preerythrocytic schizogony takes 6-16 days and results in the host cell bursting and releasing thousands of merozoites into the blood. 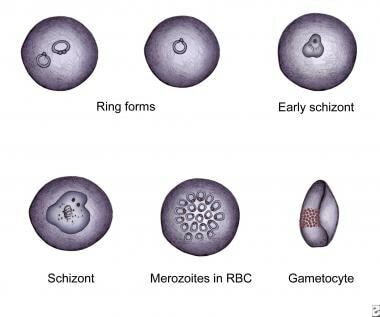 Merozoites enter the erythrocytes and initiate another asexual reproductive cycle, known as erythrocytic schizogony. The parasite successively passes through the stages of trophozoite and schizont, ultimately giving rise to several merozoites. Upon maturation of these merozoites, the erythrocyte ruptures, releasing the merozoites and multiple antigenic and pyrogenic substances into the bloodstream. These merozoites again infect new erythrocytes. After a few cycles of this erythrocytic schizogony, some merozoites differentiate into the sexual forms: the male and female gametocytes. A mosquito that takes a blood meal from a patient with gametocytemia acquires these sexual forms and plays host to the sexual stage of the plasmodial life cycle. Rupture of a large number of erythrocytes at the same time releases a large amount of pyrogens, causing the paroxysms of malarial fever. The periodicity of malarial fever depends on the time required for the erythrocytic cycle and is definite for each species. P malariae needs 72 hours for each cycle, leading to the name quartan malaria. The other 3 species each take 48 hours for 1 cycle and cause fever on alternate days (tertian malaria). However, this periodicity requires all the parasites to be developing and releasing simultaneously; if this synchronization is absent, periodicity is not observed. Most malaria acquired in Africa is due to P falciparum. P vivax dominates in Asia and the Americas. The bite of an infected female Anopheles mosquito transmits malaria. Species of mosquito capable of transmitting malaria are found in all 48 of the contiguous states of the United States. Malaria can also be transmitted through blood transfusion. Among people living in malarious areas, semi-immunity to malaria allows donors to have parasitemia without any fever or other clinical manifestations. The malaria transmitted is by the merozoites, which do not enter the liver cells. Because the liver stage is not present, curing the acute attack results in complete cure. Organ transplantation is another malarial transmission route. Transplacental malaria (ie, congenital malaria) can be significant in populations who are semi-immune to malaria. The mother may have placental parasitemia, peripheral parasitemia, or both, without any fever or other clinical manifestations. Vertical transmission of this infestation may be as high as 40% and is associated with anemia in the baby. There are several Plasmodium species that infect non-human primates. P. knowlesi is a malarial parasite of macaques, but it can be transmitted to humans and cause disease. This zoonotic disease was restricted to Malaysia and nearby parts of Asia, but is increasingly being seen in other parts of the world. P. cynomolgi is another zoonotic malaria infection, mainly reported from forest areas of Vietnam. Others are P. inui and P. coatneyi. These Plasmodium species are usually unable to infect humans because of inability to invade erythrocytes, but are overcoming these host barriers by producing the protein families required for erythrocyte invasion. The disease can be cured by treatment with artemisinin combination therapy. These zoonotic malaria species are transmitted by non-usual mosquitoes. Two known species are Anopheles balabacensis and Anopheles dirus. The non-human reservoir and non-usual vectors have the potential to impede malaria control efforts. Approximately 1300 cases of malaria are diagnosed every year in the United States, most of them acquired outside the country. Only about 1% of patients acquire the infection in the United States, with over half of the cases are acquired in Africa. Usually, fewer than 10 deaths from malaria are reported in the United States annually. Malaria is a major health problem in Africa, Asia, Central America, Oceania, and South America. About 40% of the world's population lives in areas where malaria is common. Approximately 300-500 million cases of malaria occur every year, and 1-2 million deaths occur, most of them in young children. People of all races are affected by malaria, with some exceptions. People of West African origin who do not have the Duffy blood group are not susceptible to P vivax malaria. Children of all ages living in nonmalarious areas are equally susceptible to malaria. In endemic areas, children younger than age 5 years have repeated and often serious attacks of malaria. The survivors develop partial immunity. Thus, older children and adults often have asymptomatic parasitemia (ie, the presence of plasmodia in the bloodstream without the clinical manifestations of malaria). Most deaths resulting from malaria occur in children younger than age 5 years. Uncomplicated malaria due to P vivax,P malariae, and P ovale has an excellent prognosis. Most patients have a full recovery with no sequelae. Malaria due to P falciparum is dangerous; if it is not treated quickly and completely, complicated and severe malaria can result, which carries a grave prognosis. Malaria in children younger than age 5 years carries the worst prognosis in endemic areas. In a nonimmune population, malaria is equally deadly at all ages. Repeated attacks of malaria can lead to chronic anemia, malnutrition, and stunted growth. P falciparum causes sequestration of erythrocytes in the microvasculature of the brain (and other organs). Seizures and coma are common in a child with malaria, and a prolonged postictal state should raise suspicion of this dangerous entity. Even without cerebral malaria, prolonged, frequent convulsions in a child can lead to prostration and death. A nonimmune child with heavy parasitemia sometimes develops generalized bleeding. Such bleeding is usually due to disseminated intravascular coagulation and is sometimes associated with a bacterial infection. Some degree of hemolysis is part of malaria, but some children have excessive hemolysis, putting them at risk for renal failure. This hemolysis may be related to glucose-6-phosphatase dehydrogenase (G-6-PD) deficiency or an antibody-mediated destruction of erythrocytes. Anemia is so common in malaria that it is considered almost a part of the disease. Some children have anemia far exceeding that attributable to erythrocyte destruction by the malarial parasite. Other mechanisms of anemia are dyserythropoiesis, hypersplenism, shortened erythrocyte survival, and bone marrow suppression. Malarial anemia can be quite severe, sometimes causing death. The malarial parasites consume glucose voraciously. Heavy parasitemia can result in hypoglycemia, which may be compounded by quinine and quinidine therapy. Hypoglycemia can be difficult to differentiate from cerebral malaria. Blackwater fever is a condition of hemolysis and acute renal failure. It is rarely observed now, being more common when quinine was used for prophylaxis. Advise persons visiting a malarious area regarding chemoprophylaxis and the need to continue the regimen for some weeks after leaving the area. Motivate travelers regarding chemoprophylaxis. Fewer than 20% of people diagnosed with imported malaria in the United States have taken recommended prophylaxis; more than 50% have taken no chemoprophylaxis at all. Recommend mosquito bite avoidance measures (ie, mosquito nets with insecticides, mosquito coils, and appropriate clothing). In addition, advise persons visiting a malarious area regarding treatment of malaria and provide them doses of appropriate medicines to be started if attendance at a hospital is not immediately possible. For patient education information, see Malaria. World Health Organization. WHO Fact Sheet on Malaria. Fact Sheet No 94. World Health Organization. Available at http://www.who.int/mediacentre/factsheets/fs094/en/print.html. Accessed: June 29, 2007. Bhatt S, Weiss DJ, Cameron E, et al. The effect of malaria control on Plasmodium falciparum in Africa between 2000 and 2015. Nature. 2015 Sep 16. [Medline]. Kelland K. Millions of Children's Lives Saved as Malaria Deaths Plunge -UN. Reuters Health Information. Available at http://www.medscape.com/viewarticle/851119. September 18, 2015; Accessed: September 28, 2015. Ezeamama AE, Spiegelman D, Hertzmark E, Bosch RJ, Manji KP, Duggan C, et al. HIV Infection and the Incidence of Malaria Among HIV-Exposed Children from Tanzania. J Infect Dis. 2012 May. 205(10):1486-94. [Medline]. Idro R, Marsh K, John CC, Newton CR. Cerebral Malaria; Mechanisms Of Brain Injury And Strategies For Improved Neuro-Cognitive Outcome. Pediatr Res. 2010 Jul 2. [Medline]. Scott JA, Berkley JA, Mwangi I, et al. Relation between falciparum malaria and bacteraemia in Kenyan children: a population-based, case-control study and a longitudinal study. Lancet. 2011 Oct 8. 378(9799):1316-23. [Medline]. FDA Drug Safety Communication: FDA approves label changes for antimalarial drug mefloquine hydrochloride due to risk of serious psychiatric and nerve side effects. Available at http://www.fda.gov/Drugs/DrugSafety/ucm362227.htm#. Accessed: July 30, 2013. Abdulla S, Oberholzer R, Juma O, et al. Safety and immunogenicity of RTS,S/AS02D malaria vaccine in infants. N Engl J Med. 2008 Dec 11. 359(24):2533-44. [Medline]. Griffith KS, Lewis LS, Mali S, Parise ME. Treatment of malaria in the United States: a systematic review. JAMA. 2007 May 23. 297(20):2264-77. [Medline]. [Full Text]. Sinclair D, Donegan S, Lalloo DG. Artesunate versus quinine for treating severe malaria. Cochrane Database Syst Rev. 2011 Mar 16. 3:CD005967. [Medline].